This contemporary, black frame is 1" wide with an overall size of 12 3/4" x 15 3/4". 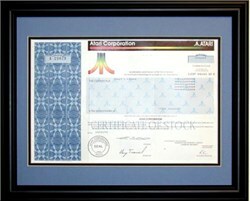 The Atari Corporation stock certificate is framed with a blue mat and black liner mat as shown in the illustration. Archival mounting, acid free backing, and clear glass are used in preparing the framed certificate. Our sales price includes the historic Atari Corporation certificate, frame with double matting, labor, packaging and shipping within the continental U.S.. The beautifully engraved certificate (with no pen marks) from the famous Atari Corporation was issued in 1987-1992. This historic document was printed by the U.S. Banknote Corporation and has an ornate block border with a vignette of the famous company logo. This certificate has the printed signature of the company's president, Jack Tramiel. These certificates are highly desirable and are rare with no pen marks. Atari was establilshed in 1972 by Nolan Bushnell, an engineer who produced his first video arcade game while tinkering with microcomputers at home. The game, Computer Space, developed in 1971, was a commercial flop, but Bushnell's second arcade game, Pong, became an overwhelming success. In 1976, Bushnell sold Atari to Warner Communications for $28 million, of which Bushnell received $15 million. Bushnell left Atari two years later and went on to start Chuck E. Cheese pizza parlors, among other things. In 1993, Atari Games became Time-Warner Interactive. In 1998, Atari Corporation software and hardware rights were sold to Hasbro, Inc., for only $5 million.